Featured in Bon Appetit's "20 Food Books to Read This Summer," Los Angeles Magazine's "Summer Reading List for Foodies," Grub Street's "10 New Food Books to Read This Summer," and Food Tank's 2015 Recommended Fall Reading List. Also available as an audiobook from Audible.com. — Steven Raichlen, author of the Barbecue! Bible cookbook series and host of PBS’s Primal Grill. Year of the Cow follows the trials and tribulations of a home cook as he begins to form a deeper relationship with food and the environment. 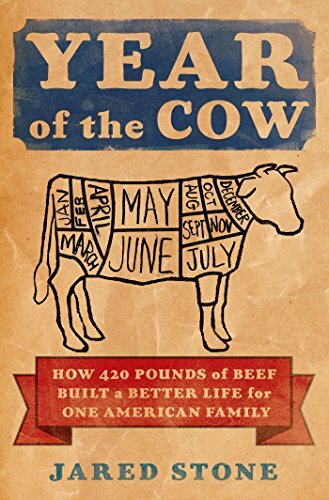 From meeting the rancher who raised his cow to learning how to successfully pack a freezer with cow parts, Stone gets to know his bovine and delves into our diets and eating habits, examining the ethnography of cattle, how previous generations ate, why environmentalists and real food aficionados are mad for grass-fed beef, why certain cuts of beef tend to end up on our plates (while boldly experimenting with the ones that don’t), and much more. Over the course of dozens of nose-to-tail meals, Jared cooks his way through his cow armed with a pioneering spirit and a good sense of humor. He becomes more mindful of his diet, makes changes to his lifestyle, and bravely confronts challenges he never expected—like how to dry beef jerky without attracting the neighborhood wildlife to the backyard, and how to find deliciousness in the less-common cuts of meat like the tongue and heart—sharing a recipe at the end of each chapter. By examining the food that fuels his life and pondering why we eat the way we do, Jared and his family slowly discover to how live a life more fully—and experience a world of culinary adventures along the way. Available wherever books are sold and as audiobook from Audible.com.